I hate to be feeding the latest kids' craze, but Crazy Bandz are now available in Singapore. Apparently these silicon rubber band bracelets are all the rage in North America and U.K. and kids love to do some serious trading with them. They are so popular that some schools have had to ban them because they are too distracting in the classroom. The popularity stems from the array of colours, shapes and themes the bracelets come in and the fact that they spring back to their original shape when taken off. 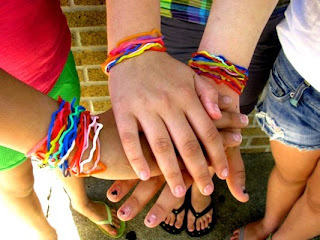 Kids wear multiple bracelets and because they are relatively cheap to buy they are a fun to swap with friends. Singapore expat mum Kate couldn't find any Crazy Bandz in Singapore for her kids, so decided to import them herself. She has started selling them at the Singapore Fairs- The Shophouse Fair and Loewen Gardens Fair, and will also take orders via email and sms straight from her website, Sillybandz Singapore. Kate says she is blown away by how fast the bands are selling and has been ordering Halloween bracelets in time for 31st. The bracelets come in packs of twelve and are a very reasonable SG$3 per pack. There are various shapes, each pack having a theme, such as 'Princess', 'Rainforest' and 'Sea Creatures'. Kate now has glow in the dark animal shapes which are hugely popular. They make a great party bag filler and the Halloween bracelets will be a great giveaway. Just don't buy them all before I get a chance to grab a few!